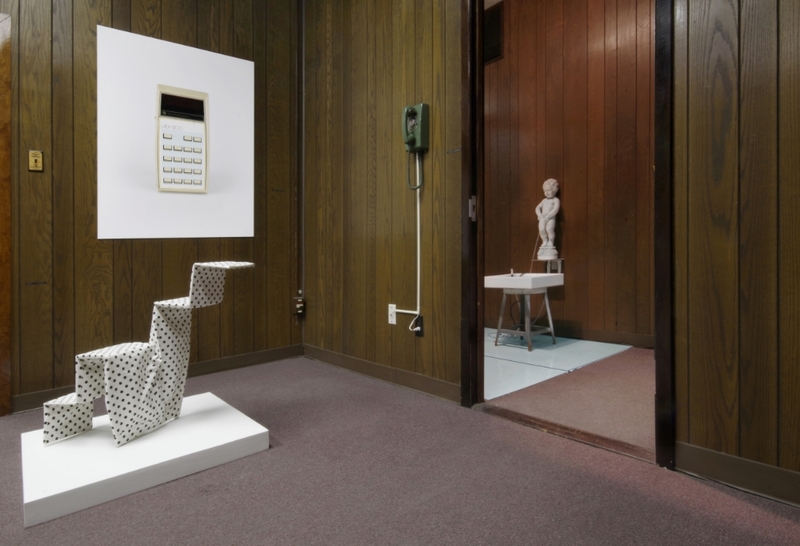 Employing appropriated found object, image, and installation accoutrements, artists offer new works taunting repetitive norms of our day-to-day prescribed culture. Curators Corey Oberlander and Lindsey Stapleton present Blue-Sky Thinking, surveying suburban disenchantment in two distinct environments. 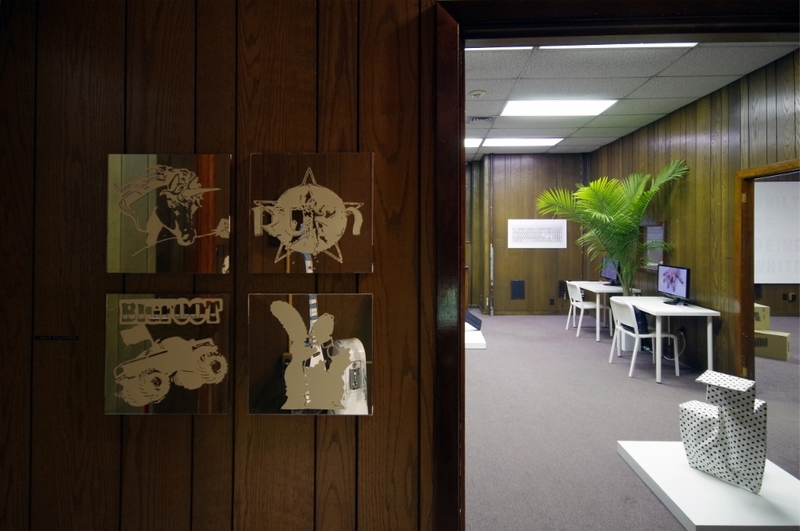 Emphasizing the pre-existing architecture in Moynihan Station, works by Sandra Erbacher, Scott Lawrence, and Shamus Clisset are placed in the setting of the pencil pusher; the clock puncher; in the daytime copy/paste holding cell, the office. Complete with cubicles, flat files, pressed trousers and paperweights, this portion of Blue-Sky Thinking critiques an eye-rolling cycle for many, the nine-to-five. On all walls, photographs by Sandra Erbacher present mundane functional objects reproduced and re-contextualized as standard stock photography. Her large-format prints monumentalize both the object and the imagined lore behind the object's alteration. 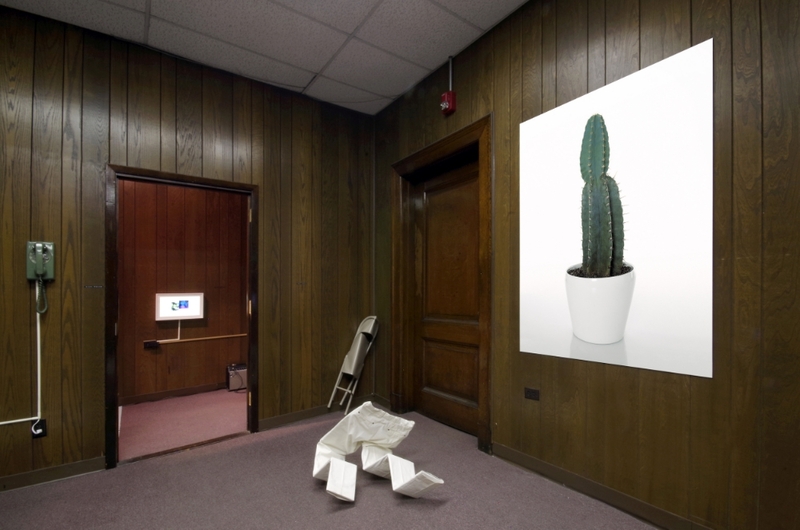 Monument, a 4x6 foot photograph of a cactus, employs stock image style-guides to present the item as an institutional object rather than a personal plant. In spite of the imposing scale and phallic form, any potential importance carried by the image is undermined by a sense of banality and pathos of the format. 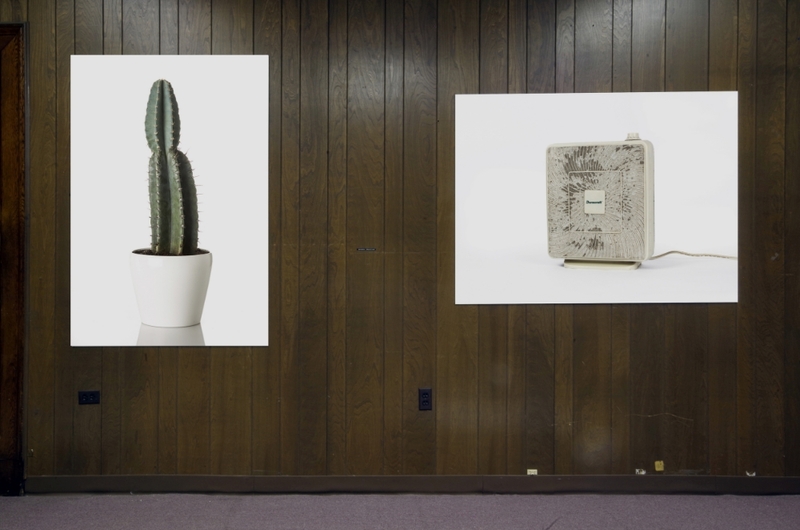 An avocado-colored phone sits quietly alongside the looming photographs. When the receiver is picked up, a stream of emotionless and dutiful words spew out of the earpiece. Likening the tone to a fictitious official, much like the character of Gerd Wiesler in the movie The Lives of the Others, Erbacher uses her voice as part of an on-going investigation into language as a system through which ideologies can be established, perpetuated, and undermined. Scott Lawrence approaches minimalism by appropriating everyday objects into cheeky, yet sophisticated sculptures. In the series Pants Sculptures, store-bought pants are stretched over flat, geometric frameworks and displayed as sculptures. In Lawrence's hands, pants become a skin, stretched to their limits and re-objectified in works whose appearance can range from the hopelessly clumsy to the positively elegant - somewhere between high-minded Minimalism and dive-bar joke. In the corner lies Folded Chair, the casualty of the artist "misunderstanding the concept" and steadfastly bending a metal chair in the wrong direction. Shamus Clisset presents digital animations presented on computer monitors as screen savers on loop, created with 3D renders of images found through a casual internet search. Combining, altering, and erasing these renders to compose his animations, Clisset gives his compositions character, purpose and tone. The pieces in Blue-Sky Thinking are simultaneously wrought with boredom and violence. In an isolated area nearby, works by Eddie Villanueva, Piper Brett, and Clark Mclean Graham confront the often mundane wake of the work day; where past-times become binding contracts devoid of sincere enjoyment. When TV Guide is the honest-to-goodness truth and the answer for "what do you want to do tonight?" falls short. By juxtaposing familiar domestic articles typically associated with elation, the artists instead pose unsettling scenarios. A coin-operated guitar sits atop a repurposed grocery store kiddie ride, functioning as the centerpiece for the room. Energized by a single quarter, the guitar lunges into action playing the self-actualized drone of The Beatles; Tomorrow Never Knows, the seminal masterpiece and closing track of Revolver. The song is a single prolonged C-chord with reverse tape loops and Ringo's constant drumbeat. The lyrics; based on passages from the Tibetan Book of the Dead. In close proximity, a series of mirrors are plastered with silhouetted pop-culture icons. Pulling directly from the branded merchandise mirrors of the 1980's; Villanueva's versions are stark and devoid of color. Clark McLean Graham works primarily as a collagist, fabricating physical and digital montages in an attempt to create contemporary relics with nods to suburban pop culture. Making time-based minimalist works utilizing mundane, easily forgettable moments, the artist creates a subjective, and subversive world. The Smooch presents side-by-side found clips of a vintage film couple engaging in a never-ending monotonous kiss, accompanied by an organ and heavy breathing. Piper Brett's The Pool is spread over much of the floor. Brett includes a crudely inflated basketball with a metal handle. A working replica of Manneken Pis by Hiëronymus Duquesnoy slowly urinates into a tote of water at the top of a workman's stool. Brett uses these objects to recreate a nostalgic, yet begrudged memory-scape reminding her of the indifferent days in the neighborhood, poolside. Through its commitment to the discoveries of local to international curators, SPRING/BREAK Art Show will again offer a unique destination for collectors, artists, galleries, critics, scene junkies & art enthusiasts during the city’s art fair week. Forty curators will premiere new artworks created by over 150 artists, all selected around this year’s central art fair theme, ⌘COPY⌘PASTE. By offering a “break” from the typical art fair model, SPRING/BREAK Art Show aims to turn observation into interaction and reimagine the trade show platform as an opportune playground, instead, of the curator’s exhibition ideal.